Are you sick of hearing the word “resilience”? Has the word lost all meaning for you? In June 2014, as part of the 100 Resilient Cities Network, a Chief Resilience Officer was appointed at council. For the following two years, the salary for the position was paid by the Rockefeller Foundation and almost nothing was heard of the activities the CRO was engaged in behind the scenes, despite the fact that the scheme purportedly “places people at the heart of a Resilient Greater Christchurch”. 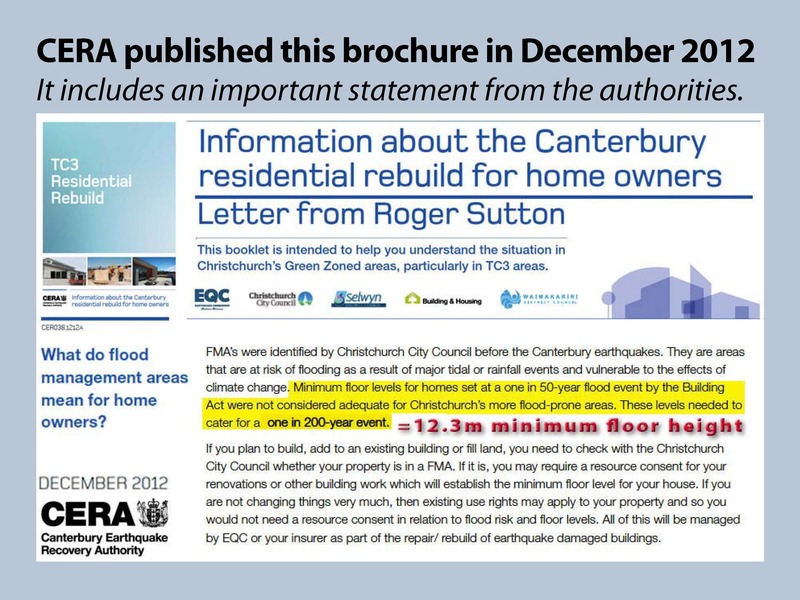 A further role of the position was to “address the needs of all city residents, and especially low-income and vulnerable populations, who were often hit hardest by shocks like natural disasters and chronic economic downturns.” Three years on, these groups are arguably in a worse position than they were in 2011 after the biggest natural disaster in New Zealand history, and council has repeatedly ignored pleas to help them (see below). When interviewed on the subject of resilience in September 2016, for example, Mayor Dalziel was unable to give any concrete examples of what the CRO had actually achieved over the previous two years. Then, in September 2016, the mayor pledged 10% of funding in the 2017/2018 financial year for resilience projects, including the salary for the CRO. It is not clear what projects have been earmarked. 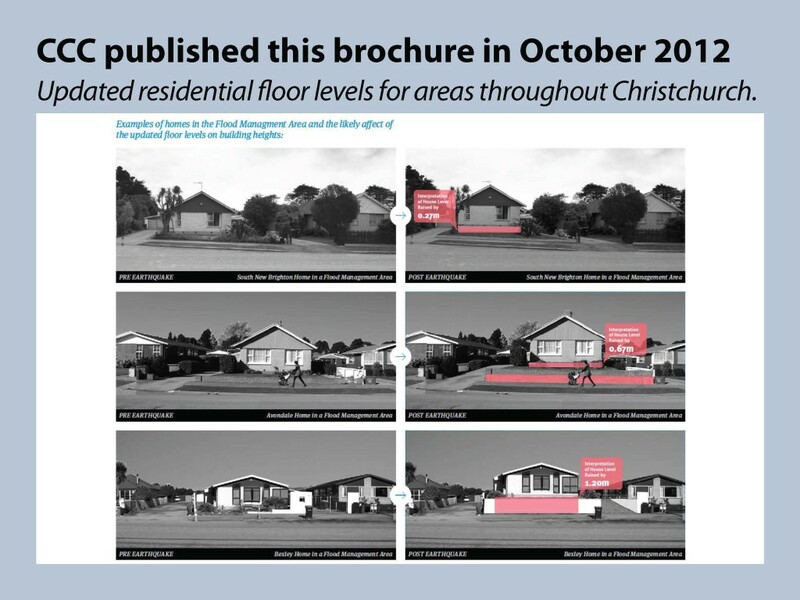 The following “Resilience Plan” from the Christchurch City Council has now become available, although, like the activities of the CRO, it has not been widely published. 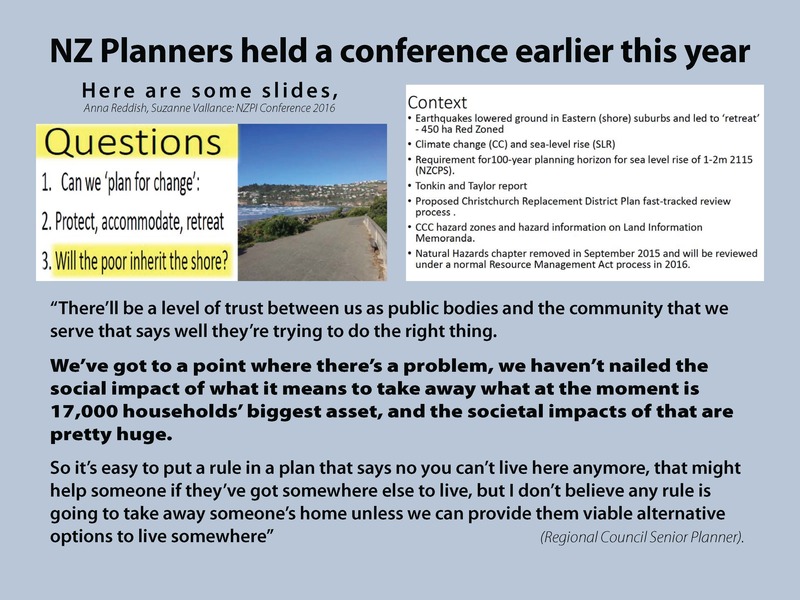 We believe it is an astonishing example of the total disconnect between theory, as trumpeted by the plan, and the actions and policies of the council in practice. Alternative facts are on the march, so beware of the following terms as used in the document: resilience, vision, stakeholder, and engagement. 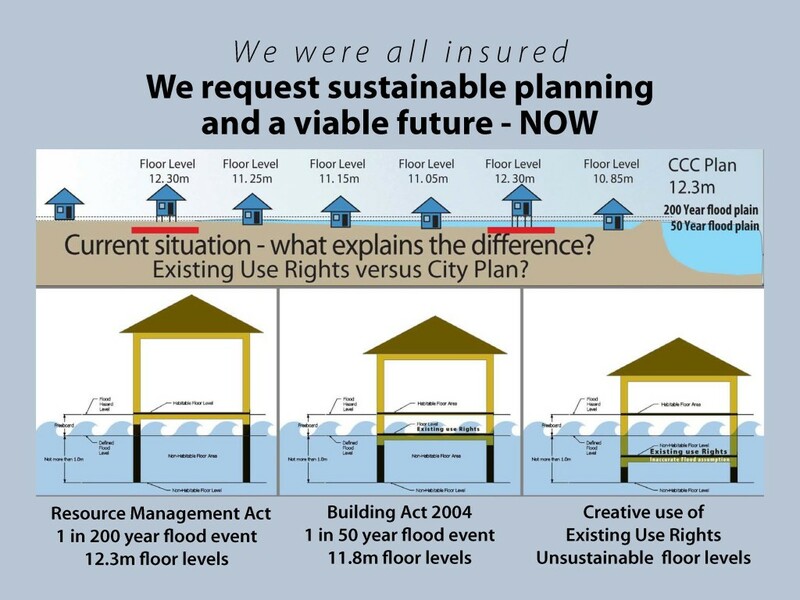 These terms appear to be euphemisms for what the city council is actually planning, which, in many cases, is the exact opposite of the accepted meaning of the term (resilience = residents taking on and paying for risks; vision = plan to rid ourselves (councils) of liability; stakeholders/we/us = the authorities, not the ratepayers; engagement = spin and propaganda to convince people of alternative facts). 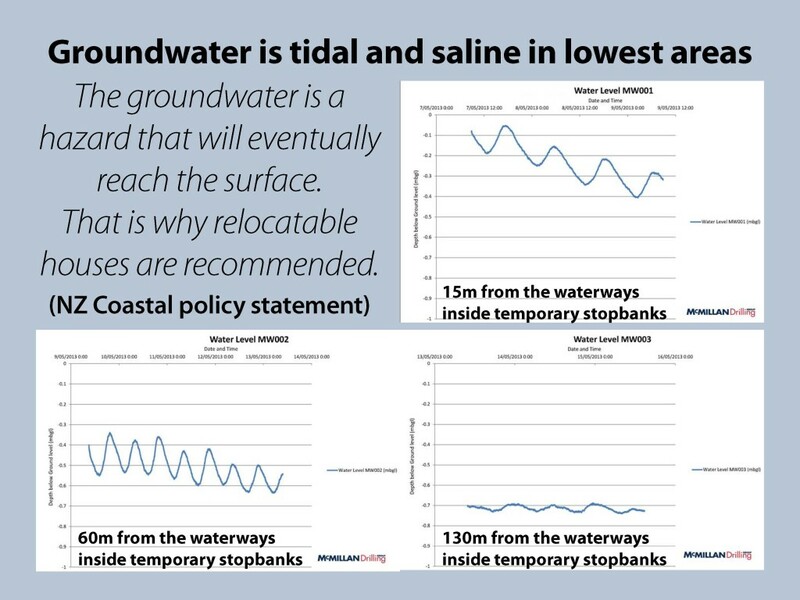 Click on the picture to read some of the key statements and statistics from the document, which has not been widely shared or publicised among the city’s worst affected communities. Empowered Christchurch comments are in italics following the excerpts. 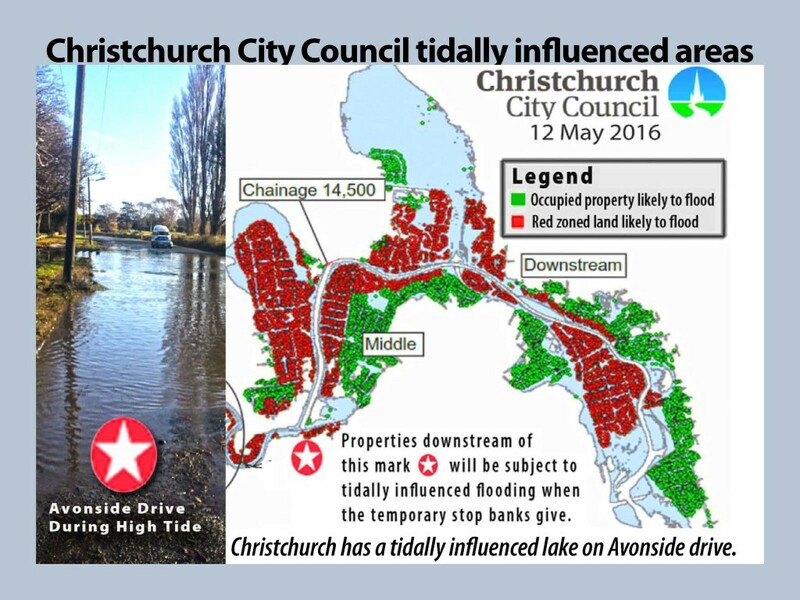 “Resilience is a word we have heard a lot in Greater Christchurch over the past five years. No matter what extent to which [sic] we are familiar with this word in our day-to-day lives, it is important that we collectively understand the concept of resilience. We know that we will encounter future challenges. This is not simply about preparing our infrastructure or our built environment and it’s not about bouncing back to the way things used to be. For us, resilience will be about understanding the risks and challenges we face and developing ways to adapt and co-create a new normal. The strength of our resilience lies in us, not just as individuals, but as communities and whānau. The [PDF 8.8MB] enables us as city and district leaders to work together to enable and empower our communities to face the future with confidence. As a group of leaders we were already working together before the earthquakes struck. By the year 2041, Greater Christchurch has a vibrant inner city, and suburban centres surrounded by thriving rural communities and towns connected by efficient and sustainable infrastructure. There are a wealth of public spaces ranging from bustling inner city streets to expansive open spaces and parks, which embrace natural systems, landscape and heritage. Innovative businesses are welcome and can thrive supported by a wide range of attractive facilities and opportunities. Prosperous communities can enjoy a variety of lifestyles in good health and safety, enriched by the diversity of cultures and the beautiful environment of Greater Christchurch. The vision has not only survived our experience; it has been enhanced. We see this resilience plan as enabling the review of the strategy to occur with a resilience lens and an ongoing commitment from each of us to visible collaborative leadership. Brighton beach and the Brighton Peninsula are featured on the cover pages of the Resilience Plan. Resilience is the capacity of individuals, communities, businesses and systems to survive, adapt and grow, no matter what chronic stresses and acute shocks they experience. Hutia te rito o te harakeke, kei hea to komko e ko?Whakatairangatia, rere ki uta, rere ki tai. If we were to pull out the centre shoot of the flax plant, where would the bell bird sing from?It will fly aimlessly inland and out to sea.Ask me what is the most important thing in our world? P10: “Embracing participatory planning and collaborative decision-making. 8000 households permanently displaced by land damage, 90% of residential properties damaged in some way, and 80% of buildings in the CBD have had to be demolished. P36 “Residents want to be involved in the decisions that affect their neighbourhoods and communities…. P49 “What outcomes do we expect to see? P51 “What outcomes do we expect to see? 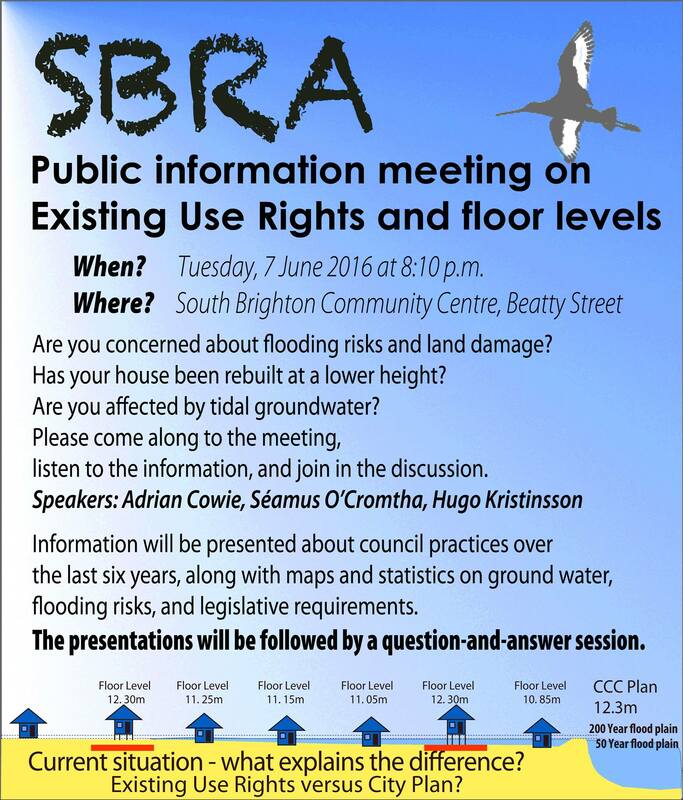 (This is one example of the many pseudo-community consultation schemes that have sprung up since the earthquakes. P85 “What outcomes do we expect to see? Open and transparent engagement with people using understandable information to help them make decisions and balance the consequences of action or inaction in relation to risk management. Risk acceptance is a state of being that influences the level of risk reduction and risk transfer, and ultimately the level of tiredness we are willing to investing and it can change as we use other responses. 6.3 km2 red zoned and 7,300 homes purchased by government. 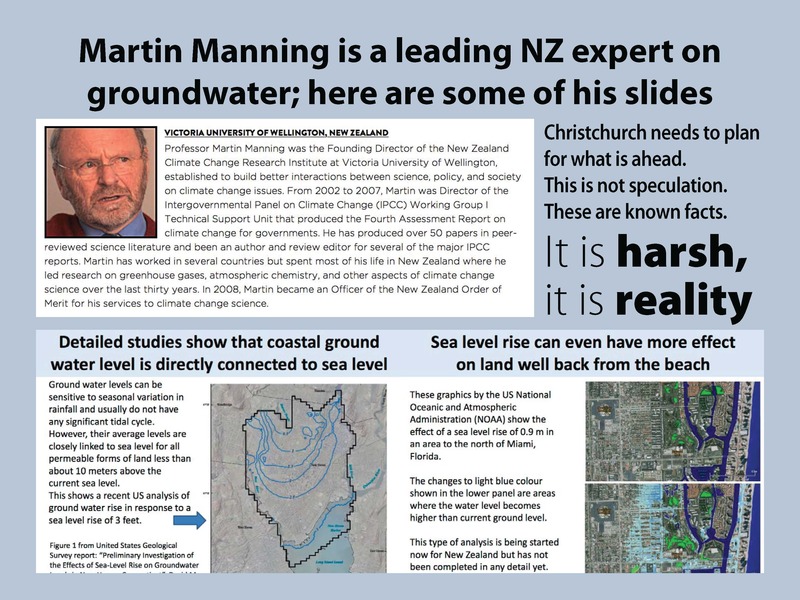 “Securing our future in the eastern parts of Christchurch will require a multi-party collaboration to resolve a range of different issues that include social and economic problems, future risk from climate change, particularly sea level rise, and the reuse of earthquake damaged land, and water management. Our response needs to consider the cost as well as the potential benefits for the community. Here is a graphical analysis of the Christchurch High Court earthquake list as at 30 September 2016. Mouse over the insurers in the left-hand section to see how many High Court cases each one is involved in. Clicking on each rectangle activates the pie chart and map information for one insurer. 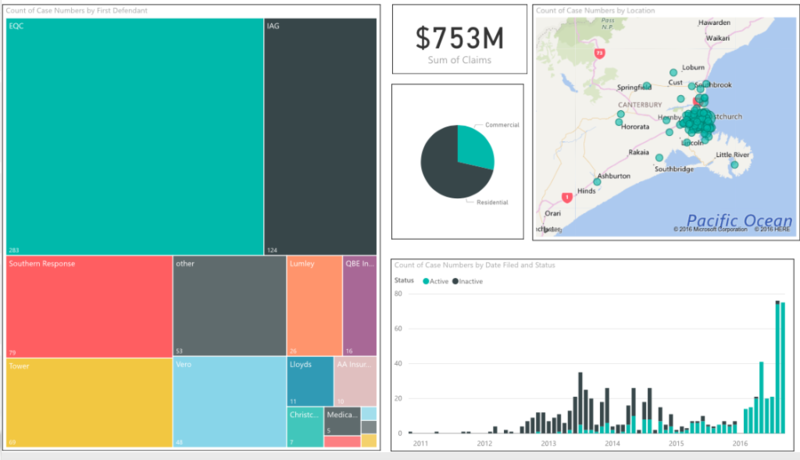 If you move the mouse over the pie chart in the centre, you can see the total dollar values for residential and commercial claims against the particular insurer. The “highlighted” figure shown is for the area of the chart the mouse is currently in. In the block diagram showing active and inactive cases at the bottom right, you can grey out either category by clicking on the circle beside the other category (e.g. click on “active” to highlight these cases only, or click on “inactive” to highlight inactive cases). You can see that almost no cases are inactive for the months of 2016. The map shows the number of High Court cases by location by insurer. So you can immediately see where the main geographic concentrations for the respective insurers are. For example, claimants against Lloyd’s of London (which will be predominantly commercial claims) are almost exclusively in the city centre. For the large rectangles like EQC and IAG, with heavy concentrations throughout the city, if you mouse slowly over each suburb, you can see the number of people in each who have sued the insurer in question in the High Court. 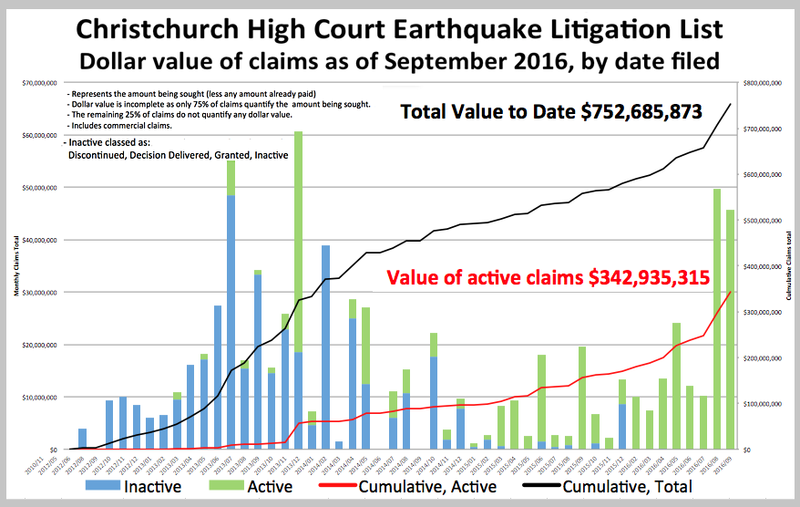 This graph shows the gradual accumulation of High Court earthquake insurance claims expressed in dollars, starting from the first earthquake in September 2010. The blue columns represent High Court cases that are inactive (i.e. have been discontinued, cash settled, withdrawn, etc., or where a decision has been delivered by the court). The green columns represent active cases that are still to be heard. The red line shows the accumulation of costs for active cases, while the black line shows the accumulation of active and completed cases combined. Note the spikes in the number in July and December 2013, and in August/September 2016 (end of the period of limitation). 25% of claims do not specify a dollar value for the claim. This means that the combined total of $752,685,873 is well short of the full amount that is being claimed. In all probability, the complete figure is over $1,000,000,000. 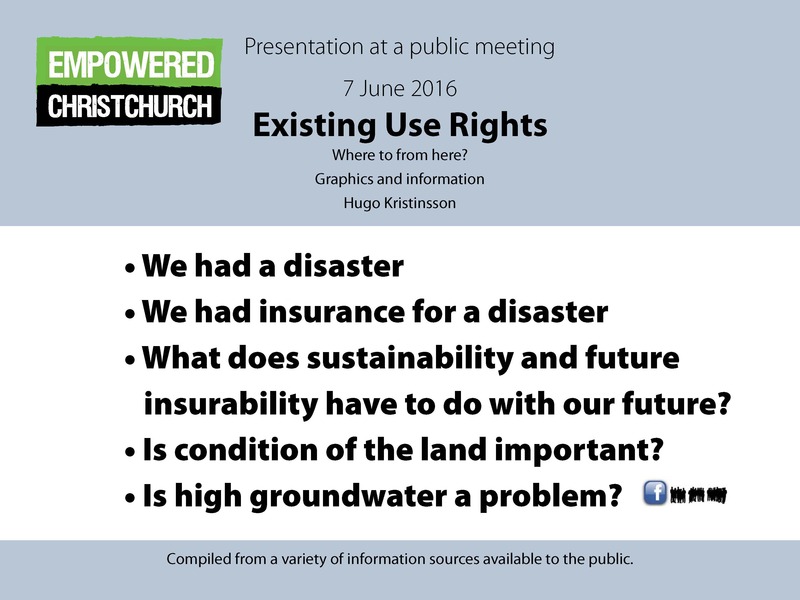 It should also be remembered that these are only claimants who have decided to sue their insurer or EQC. We should not forget low-income and vulnerable claimants, people with mental and physical health problems, the elderly, and those who accepted cash settlements. These are the real victims of the recovery. While every care has been taken in compiling the statistics, Empowered Christchurch assumes no responsibility for the accuracy of the information. The EQC leads the field with a total of 107 cases, while 79 of the Southern Response cases have been concluded. This means that government-controlled entities make up 186 (55%) of the total. Almost all of these will be under cap and “repair” cases – an unknown number of land cases are still to come. Lumley is an IAG subsidiary, which means that the IAG Group accounts for close to one third (105) of the 336 concluded cases. Concluded cases do not actually go to court for one reason or another. They are frequently (cash) settled shortly before High Court proceedings commence, which is when serious legal costs accrue for the insurance companies. This figure shows the current High Court list of active cases. Since our focus is on residential claims, companies writing mainly commercial business, such as QBE Insurance (13 cases), have been excluded. As with the statistics for concluded cases, the EQC is the clear leader, with 37% of the total of 402 active cases. The IAG Group (IAG + Lumley) account for 28%. IAG has still to settle approximately 60% of its total court cases (concluded and active), as does its subsidiary, Lumley. Vero, the number 2 in the private insurance market in New Zealand, has slightly more than 60% of its defence cases still to be heard (or cash settled). 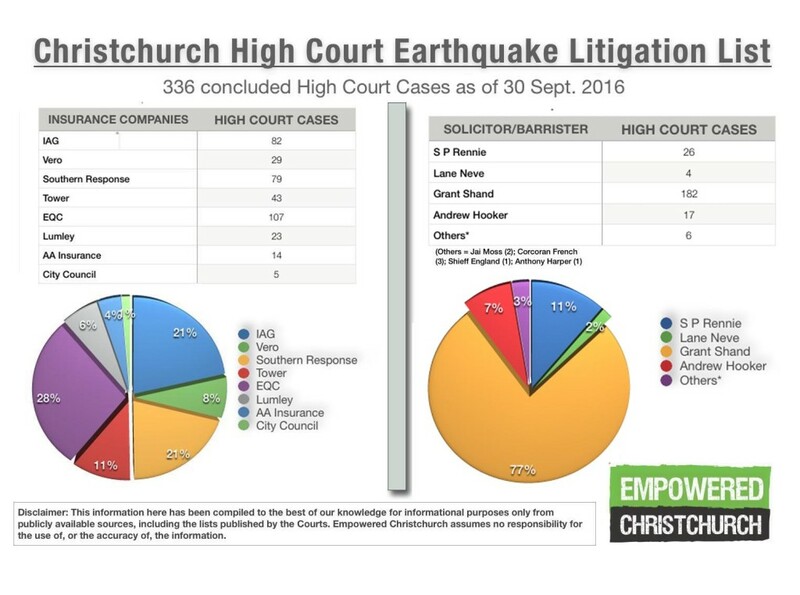 The EQC’s combined total of 310 High Court cases (to date) leaves it with roughly two thirds of the way to go. 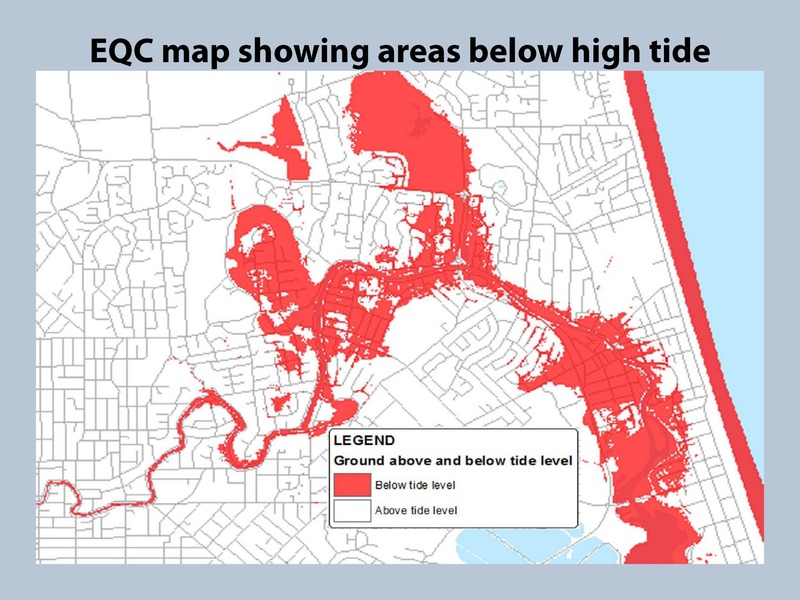 Most of the future claims for EQC land damage may be handled by the District Court (<$250,000) rather than the High Court. The smaller players (Tower and AA) have still to defend between 50% and 60% of their respective cases. Overall, therefore, the spread of remaining cases from best to worst is quite narrow, between 53% (Tower) and 66% (EQC). Are you paying too much for your insurance premiums? This could be one reason. The New Zealand insurance industry is dominated by two Australian groups, Sydney-based IAG (Insurance Australia Group) and Suncorp Group Limited, a Brisbane-based finance, banking and insurance corporation. IAG bought the AMI business in 2011 after the latter became insolvent, leaving the outstanding earthquake claims to be handled by the government through the new entity, Southern Response. In December 2013, the IAG Group announced a A$1.845 billion deal to buy the underwriting businesses of Australia’s Wesfarmers, which included Lumley in New Zealand. At this point, IAG already owned NZI (its broker arm), State and AMI (non-quake related business), and was also behind cover provided by ASB, BNZ, and Cooperative Bank, and Warehouse Travel. The Lumley deal increased the group’s share of the overall New Zealand insurance market from 41.5% to around 50.5% and the new acquisition reportedly increased its share of the New Zealand home and motor insurance market from 60% to as much as 66%. In Germany and the USA, the market leader controls only around 10% of the overall market. In addition, since it owned three of the main four banking relationships, IAG was now in a position to ensure that price increases could occur across the majority of the bank channels. This section looks at the market share of the second-biggest player. The Suncorp Group owns Vero Insurance, (known until 2003 as Royal & SunAlliance), which is New Zealand’s second-largest insurer, as well as SIS Insurance, AMP General Insurance, Axiom Insurance and Asteron Life. Vero operates through a large stable of different companies, covering most classes of insurance (commercial, marine, liability, travel and motor, as well as specialist risks) and sells exclusively to the broker market. Vero also holds a 68% share in AA Insurance. 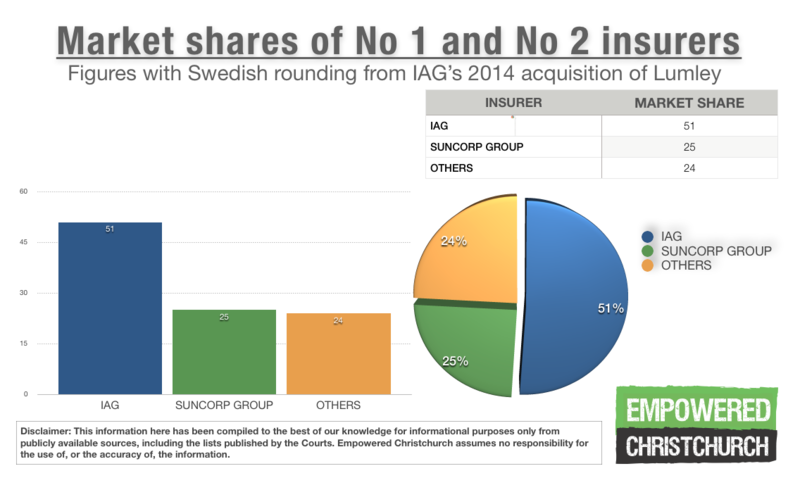 After IAG’s purchase of Lumley, however, Suncorp’s total market share of 23.5% of the general insurance market paled into insignificance in comparison with its rival. When taken together, these two groups control just under 75% of the general insurance market in New Zealand. As pointed out earlier, this contrasts dramatically with other insurance markets such as Germany and the USA, where the market leader controls only around 10% of the overall market. 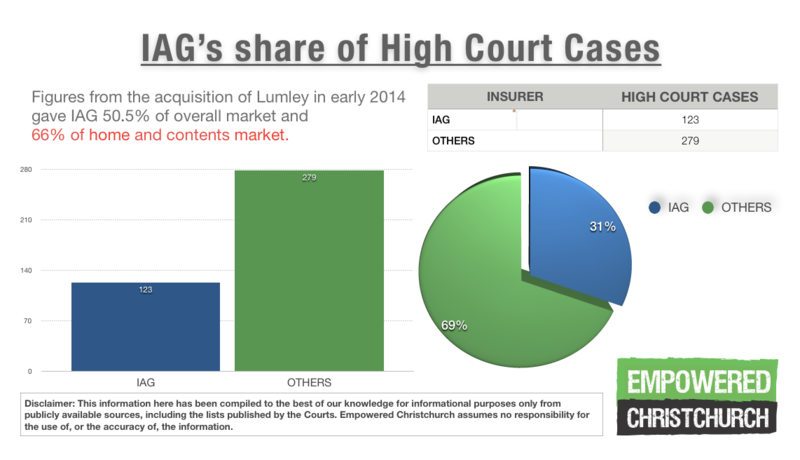 In a submission to the New Zealand Commerce Commission in 2014, Suncorp objected to IAG’s acquisition of Lumley on the grounds that it would seriously decrease competition, particularly in the home and contents market, and also in the motor insurance segment. It pointed out that, at the end of 2013, IAG had settled 51% of its earthquake claims, compared to Lumley’s 70%. Purchasing a better performing rival, it argued, would “decrease the competitive tension on IAG to improve its claims handling record”. However, despite the virtual cartel situation that resulted, the Commerce Commission gave the OK for the Lumley purchase by IAG without demur. A press article on the subject led with a picture of a small dog representing the Commerce Commission, the presumed metaphor being the Commission as poodle, with the government’s firm hand on the leash. 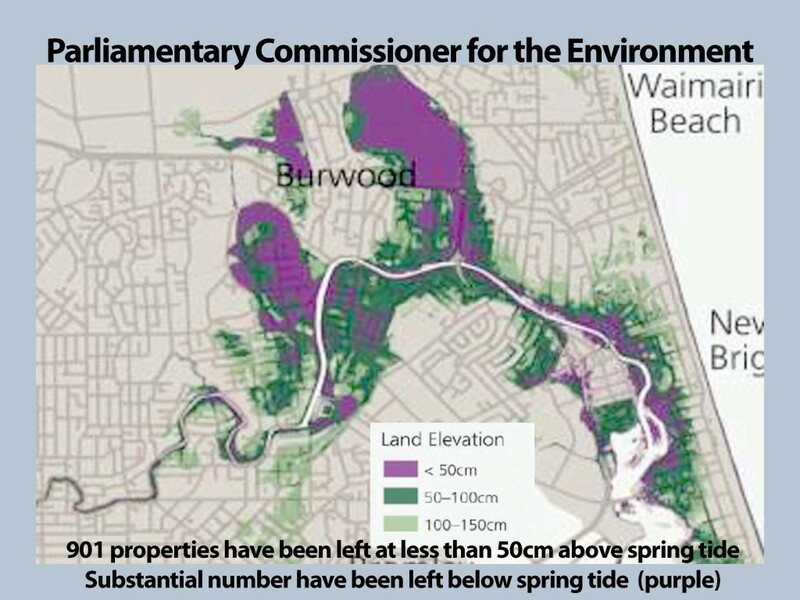 The EQC is, of course, the elephant in the room. With 203 cases before the High Court, and 10,492 remedial claims as at the end of June 2016, the Earthquake Commission, whose stated function when set up in 1993 was “to reduce distress, both in those immediately affected by the disaster, and in the New Zealand economy and society”, appears determined to reduce the distress to the New Zealand economy only. Adopting a similar strategy to IAG, the EQC has given homeowners until the end of October 2016 to decide to either take a cash settlement, or to remain in the organisation’s managed repair queue. The Commission’s series of 6 community information meetings on DoV (diminution of value) payments for “increased liquefaction vulnerability” was abruptly terminated without explanation in mid-October. 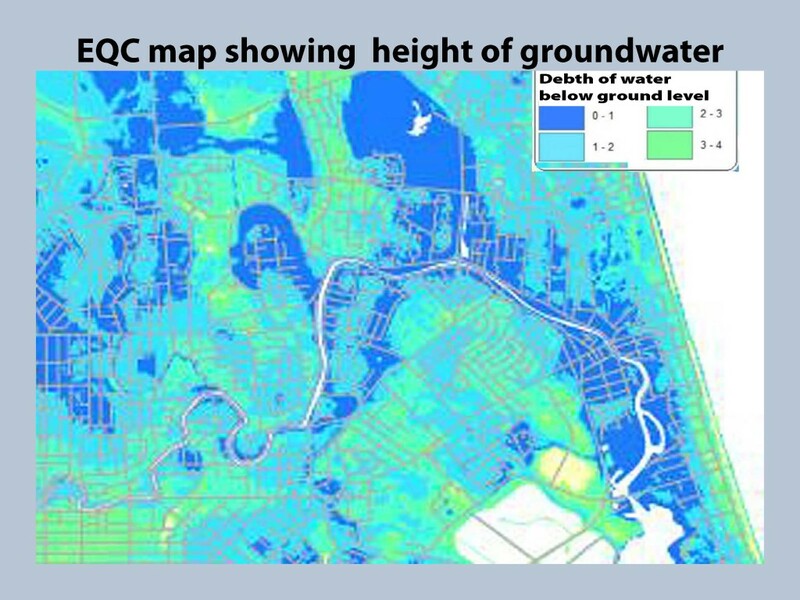 There are indications that many homeowners will also be suing EQC for its volte face on land remediation, since it paid the full pre-earthquake land value to homeowners affected by the September 2010 earthquake and many homeowners now face much more serious land damage, for which they are scarcely being compensated. Southern Response’s efforts to reduce its claims payments also seem likely to be the subject of litigation for quite some time. 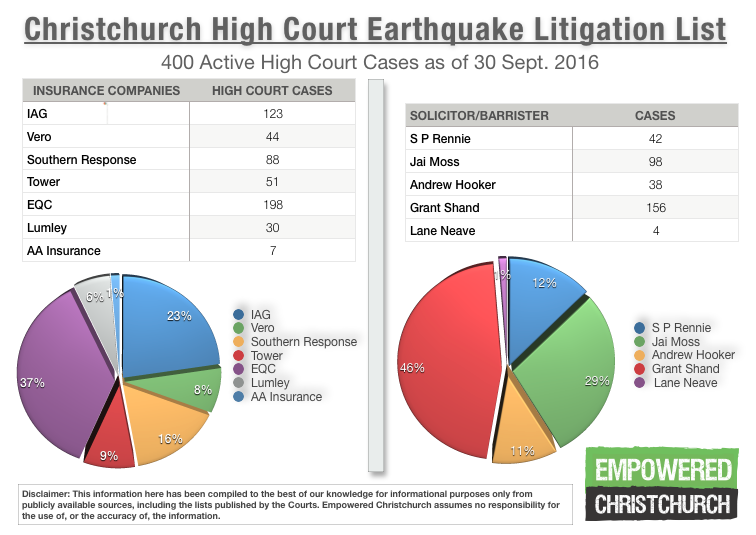 Southern Response is the defendant in roughly 88 active High Court cases, half of which are with EQC as its co-defendant. So far, it has received two Crown pledges of $500 million, with an additional $250 million dollars approved. Its figure for payouts and operating costs is $2.28bn, with the gross cost of claims estimated at $2.904bn. This contrasts sharply with the forecast Crown support figure of $1.132bn. Of the smaller insurance companies involved in the High Court litigation, the most noteworthy is Tower, a New Zealand insurer that claimed to have 10.5% of the house insurance market at the end of 2013. However, the company had a disproportionately large share of over cap claims transferred to it by the EQC (11,070 claims or approx. 35%). And with 45 or so active High Court cases, it accounts for roughly 11% of the total. Tower’s share price has been falling for much of this year and according to press reports, it is expected to face a $75m bill, as its reinsurance cover for the February 2011 event has already run out. Disclaimer: This information here has been compiled to the best of our knowledge for informational purposes only from publicly available sources, including the lists published by the Courts. Empowered Christchurch assumes no responsibility for the use of, or the accuracy of, the information. 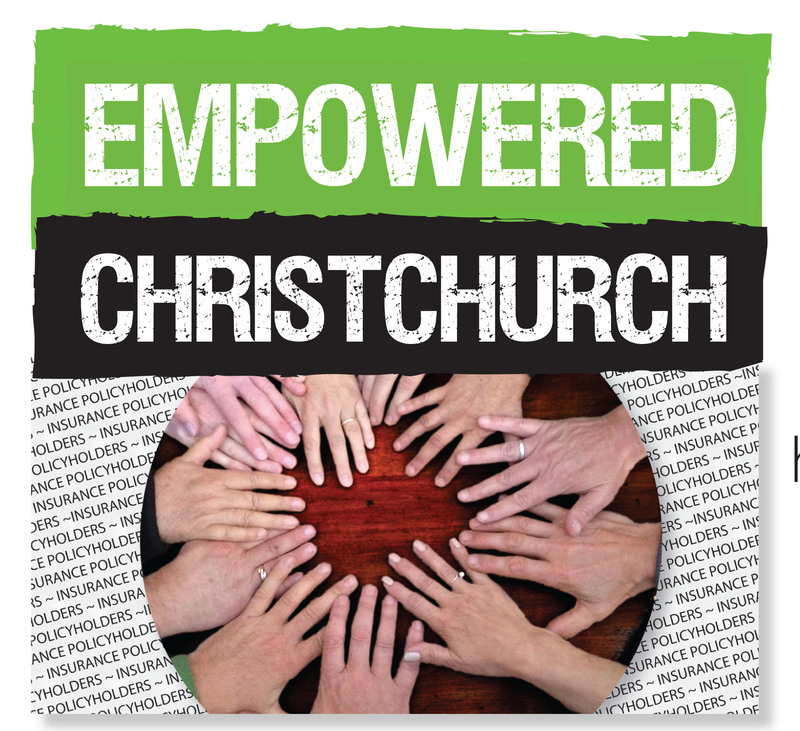 Empowered Christchurch has been extremely active since the protest rally on 21 February 2016. 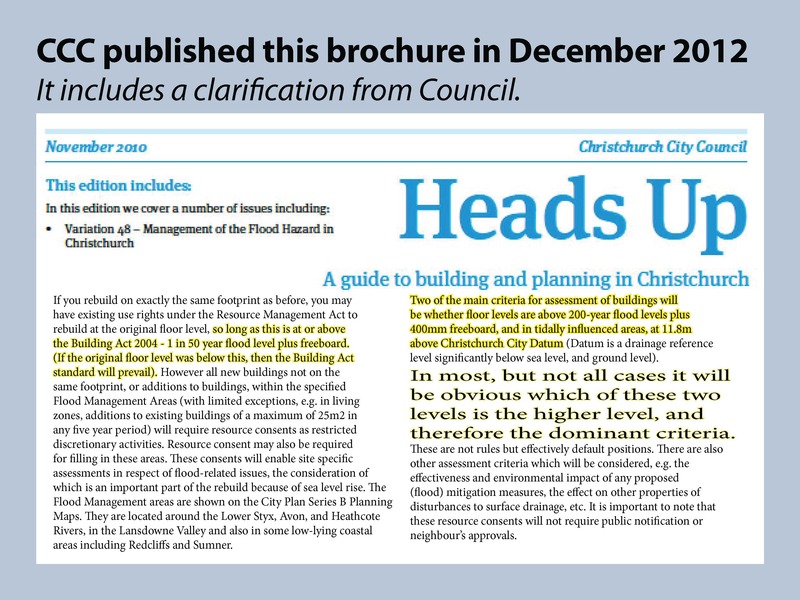 Following on from the submission made to the Local Government and Environment Committee on the Regenerate Christchurch Bill back in December 2015, further submissions were made on the Replacement Christchurch District Plan at the end of February this year. A hearing panel of judges listened to submissions from community groups and individuals. 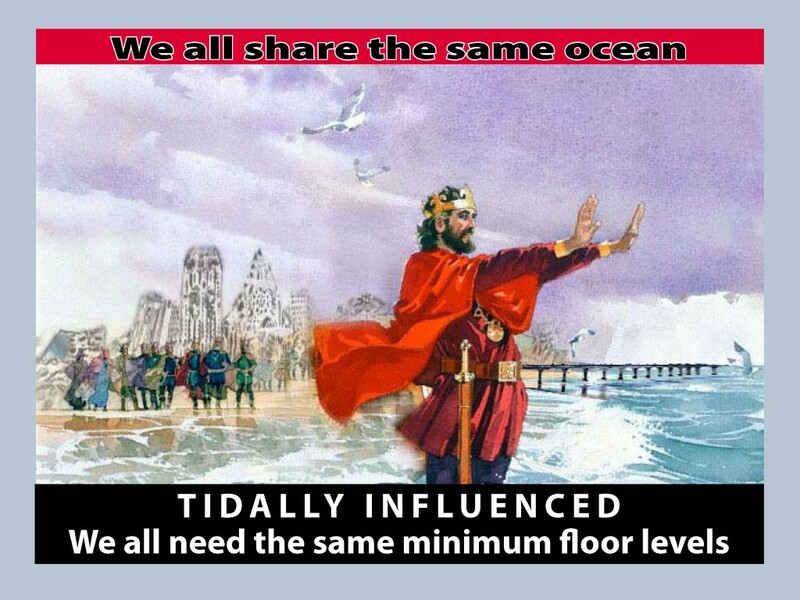 One of the chapters covered was on coastal environment and the other on natural hazards. 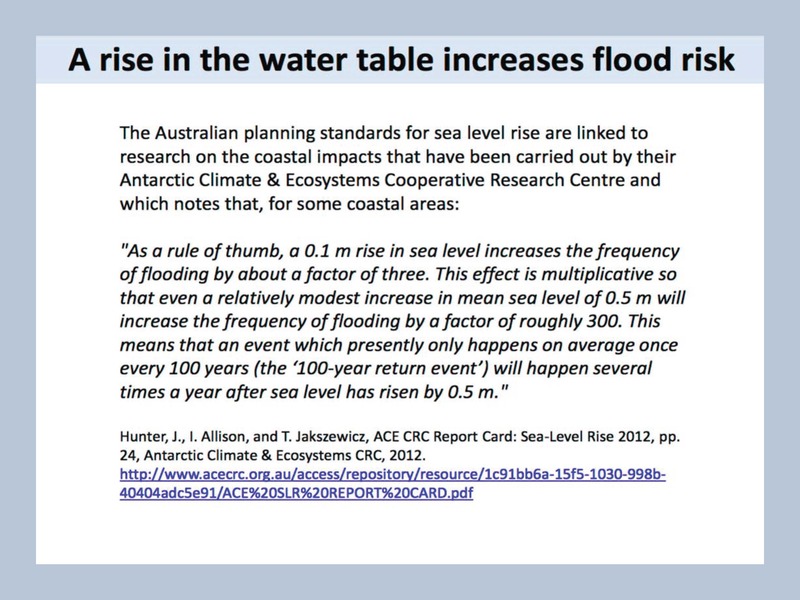 On 3 March, based on the evidence provided, the independent hearings panel asked the council to provide supplementary information on 1) sea level rise, 2) flood ponding management areas, and 3) permitted activities in rural areas. Most of this was duly submitted on 21 March 2016. 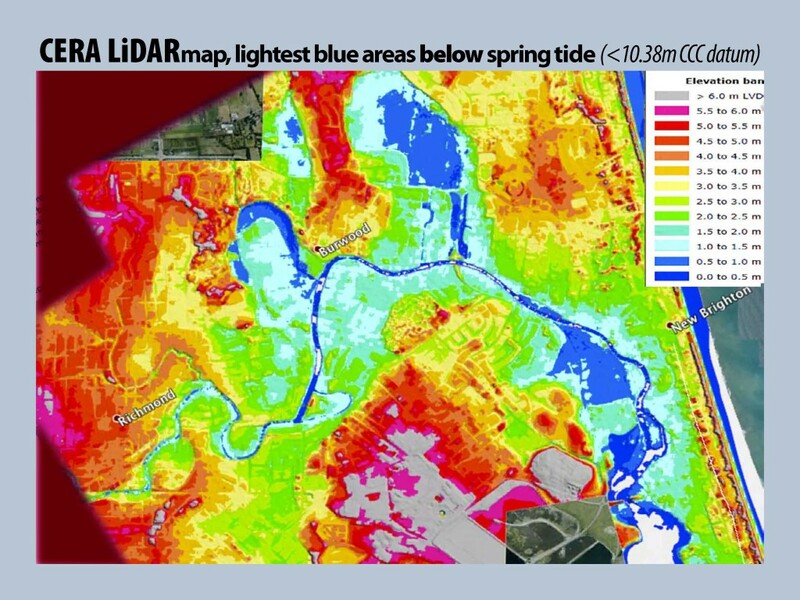 However, on 20 April 2016, Council requested an extension for providing evidence on further high flood hazard modeling to Friday, 20 May 2016. The extension was granted the next day. At the Seismics in the City meeting on 18 March 2016, we asked the Mayor, Lianne Dalziel, why she had not followed up on her offer to meet with us after the protest rally. A meeting was subsequently arranged for the morning of 6 April 2016. Here, the discussions centred on existing use rights (EURs), flood protection, ground water and building in high risk flood management areas (HRFMAs). The Mayor stated that Council lacked a statutory legal basis to prevent EUR rebuilds at the low floor levels we described (and illustrated with pictures). 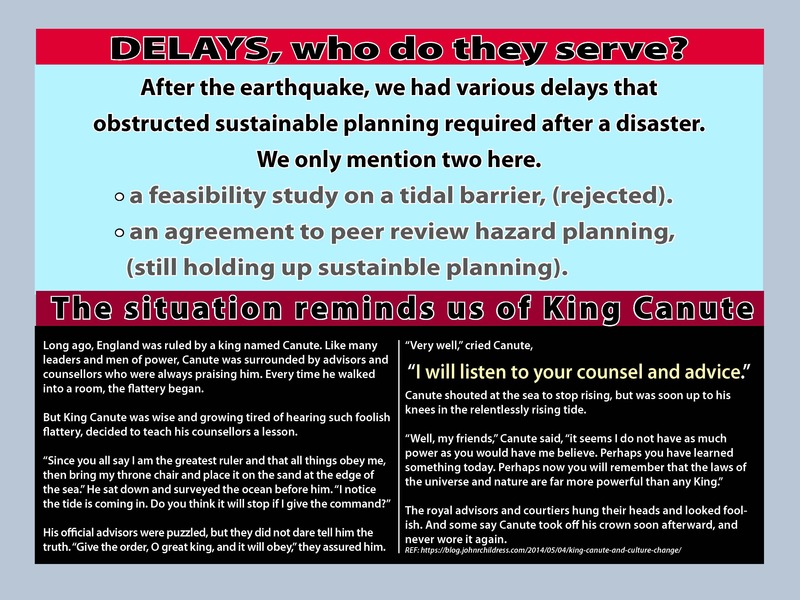 On existing use rights (EURs), Council agreed to seek a legal opinion from its solicitor, Brent Pizzey, as to whether EURs ceased to exist after a building platform has settled or removed laterally following an earthquake (a query made by Adrian Cowie). Council also undertook to follow the example of the MBIE and post a statement on its website reminding residents that Council regulations were not necessarily the same as insurance policy entitlements. We were told a working group would be set up to define the problems and determine the areas where Council could do something. A written response was promised by 20 April 2016, while the public would be kept informed on the Council website. No update has been forthcoming, but we did have a further meeting with Council on 26 April and will report on that in the near future..